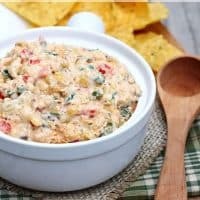 I love a good dip–one that’s loaded with all kinds of textures and flavors–and this Roasted Corn and Jalapeno Dip is one of my favorites. This dip is a little bit spicy and a little bit sweet and goes perfectly with crispy tortilla chips. And roasting the corn adds a great smoky flavor. I usually roast my corn right on my backyard grill, but I’ve also roasted it in the oven with great results. I’ve shared the method for outdoor grilling below, but there is a great recipe for oven roasted corn here, if you’d like to go that route. Either way, this dip is delicious! Preheat grill for medium-high heat. Brush corn cobs with olive oil and sprinkle with salt and pepper. Grill corn, turning frequently, until hot and lightly charred all over, 10-15 minutes. Let cool and slice kernels from cobs. Preheat oven to 350 degrees. In a medium bowl, stir together the cream cheese, mayonnaise, cheese, garlic, chili powder, and chipotles in adobo until well combined. Add the corn, jalapeno, red pepper, green onion and cilantro. Place dip in an oven-proof dish and bake for 20-25 minutes, or until bubbly and light golden brown. Serve with tortilla chips. Made this last week as a side dish for our “taco tuesday” and apparently one recipe is not enough. It is EXTREMELY addictive. My sister stopped by right after supper and made herself a small plate. Soon after she left my mother showed up looking for “crack corn”. The next morning, my hubby took it to work at the fire station. That didn’t make it to lunch. 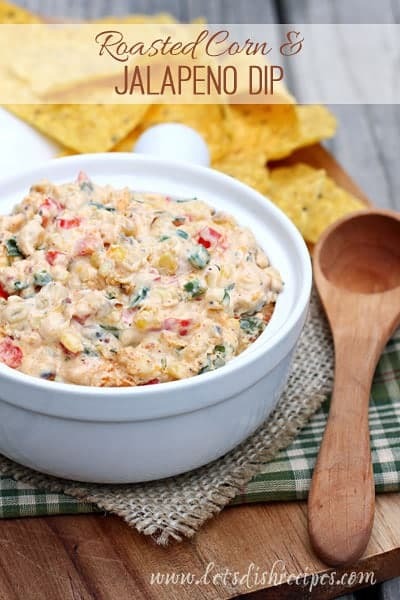 Now, the guys want their own “taco tuesday” with this corn dip. Way to go, Danelle!